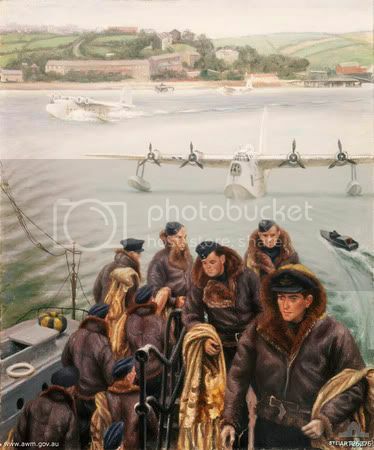 I knew of Stella Bowen from her 'Bomber Crew' painting so was pleasantly surprised to find she had painted another crew - A Sunderland crew comes ashore at Pembroke Dock. Group portrait of the crew of Short Sunderland flying boat, 461 Squadron, RAAF at Pembroke Dock, Wales. Seen as crew come up the steps are: Fredrick (Derry) Syme (pilot), Ronald Warfield (navigator), Ron Tyson (gunner), Eric Genders (gunner) and Charlie Martin (third pilot), 'Spud' Murphy (wireless operator/air gunner), Bob Mead (wireless operator/gunner), Merv Pike (second pilot), Jock Beattie (RAF, first engineer), 'Curly' Rowland (RAF, second engineer) and John Bishop (RAF, wireless operator/gunner) at Pembroke Dock, Wales. The last three were RAF, the others RAAF. Sunderland flying boats, part of tender from which crew is landing. I'll endeavour to check my copy of Ashworth's The ANZAC Squadron to see what references to this crew are in it. Feel free to jump in if you have any info on this crew. Other than that, isn't it a wonderful image? Incidentally, I would hazard a guess that you can get a copy of this print from the AWM. Yes, I have that AWM page with very nice painting. That crew were on ops together (apart from Martin) on Sunderland ML744 in June 1944. 631608	Sgt. Beattie, R E 'Jock' RAF Flt. Engr. 1624550	Sgt. Rowland, 'Curly' RAF 2nd Engr. Herington Vol.4 p.245 has: 8 Aug 44 X/461; Footnote: F-Lt F M Syme, 401630; 461 Sqn. Farmer; of Nyora, Vic; b. Warracknabeal, Vic, 13 Sep 1920. Otherwise not much on the others apart from where their names and service numbers appear on 461 Sqn ORB’s. I have a database with over 3,500 Sunderland crew memebers. 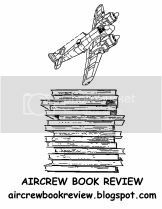 Ashworth's book The ANZAC Squadron is a very good source of info on 461 Sqn. I am in regular contact with Joe Leach (WOP/AG on W3983 10 Sqn RAAF), now 92, at Nelson Bay and usually visit him when I am in Oz to see my pom relatives at Gordon and elsewhere. I am only 82. I've got Joe Leach's RAAF Flying Boats At War - The Way It Was on the shelf but have yet to read it. Glad to hear he is still with us. So many books ... not enough shelf space!